With the ever increasing need of refrigeration in the Oil & Gas industry, it is good to know that CSI Compressco is there to provide all your refrigeration needs. Whether you are replacing an existing reciprocating compressor, an inefficiently operating rotary screw compressor, or designing a plant from ground level, CSI Compressco can provide the service and assistance needed for a successful operation. 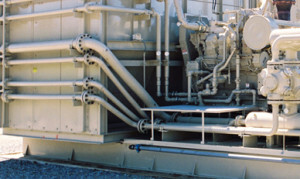 CSI Compressco has provided numerous rotary screw compressors for the refrigeration process in the Oil & Gas industry. From natural gas engine driven packages that can operate in remote environments where power might not be available, to NEMA tunnel mounted electric driven packages mounted on horizontal separators for smaller installation areas, CSI Compressco can provide it all. CSI Compressco can also provide assistance in the design of, and even supply the condenser for your refrigeration project. All CSI Compressco packages can be configured to match the customer’s specific requirements. All CSI Compressco refrigeration packages are equipped with automatic Variable Volume Ratio (VI) control as well as automated capacity control to provide a seamless transition from season to season and as the refrigeration demands change. This eliminates any power consumption penalty associated with over or under compression.